Having moved on a distance of three weeks from the inaugural edition of our BES Conference Report, we unveil our Week 6 update on the strength of both conferences and their respective divisions. The NFC has significantly closed the gap on the AFC. That is primarily due to the NFC South and NFC North both gaining strength while the AFC East and AFC West have weakened. 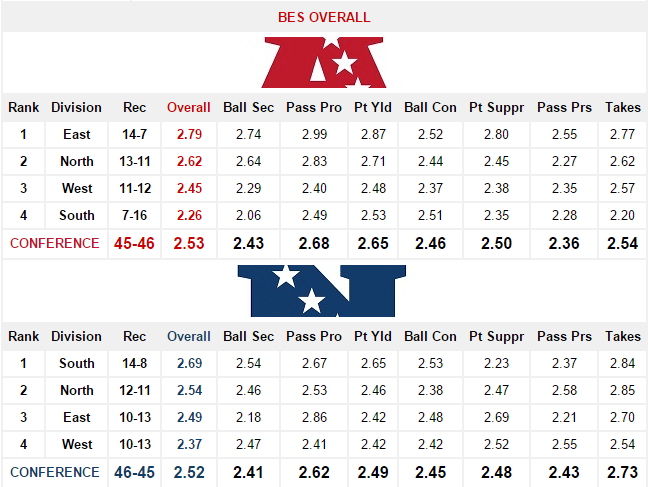 For a closer look at how all 32 teams stack up against each other see our Week 6 BES rankings. That Packer Broncos game is pivotal. It could shape up to be a Patriot/Bengal AFC and Packer/Panther NFC divisional playoffs. But anything is still possible.